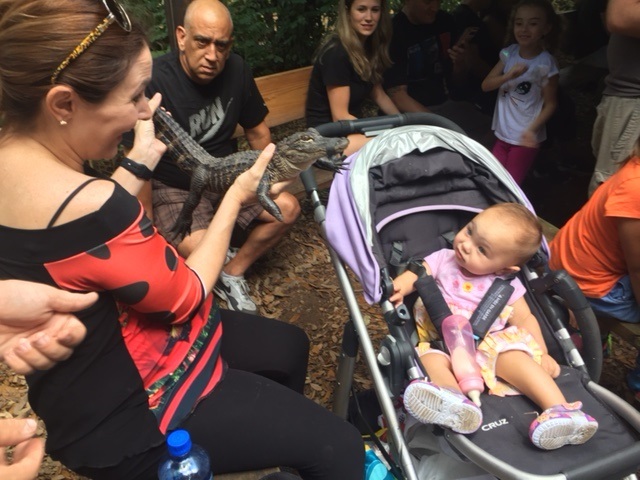 Animal House: Guests of all ages interacted with furry and scaly friends at Miami's Safari Edventure. MIAMI (Apr. 4, 2017) -- The entire Noah’s Ark roster was there: alligators, parrots, wolves, lemurs, hedgehogs, kangaroos, and more joined a group of Wounded Warrior Project® (WWP) veterans and their guests at Miami’s Safari Edventure, a hands-on nature preserve. These WWP connection events give wounded warriors an opportunity to experience firsthand what is possible at social gatherings that get them connected with fellow service members. Making new friends is an important part of connection events for warriors and families. Emma made a new connection that delighted her: “The new friend I met on this trip and I have something great in common: we both provide support for our warriors,” she said. Warriors and families find out about how WWP connects, serves, and empowers in numerous ways: battle buddies and commercials are only two. Another way? Friendly, helpful WWP staff. “I can’t wait to connect with my event coordinator again. I found out about a few programs that I’m interested in learning more about,” said Emma, who discovered WWP through a caregiver friend. The 2016 WWP Annual Warrior Survey highlights the importance of connection at WWP outreach events. These settings support the long-term recovery of warriors with physical injuries and social anxieties. To learn and see more about how WWP’s programs connect, serve, and empower wounded warriors, visit http://newsroom.woundedwarriorproject.org/, and click on multimedia.